Here are a few shots from the first of three concerts. 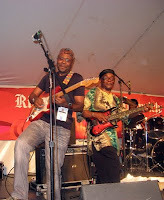 Samba was in fine form and he and and his band were very well received! 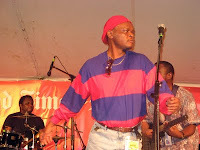 Samba was joined on stage by a well-chosen group of talented musicians, most of whom are Congolese or East Africans who now reside here in the Mid-Atlantic states. 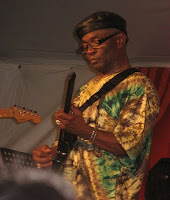 Misha Mfum (ex - Empire Bakuba). Misha has a strong voice and a stage presence that rivals just about anyone. He tells me that he'd like to reissue his solo album Empire Ambiance. Personally, I think he has the talent to consider making an album of new material. Getry Mavambu (ex - Afrisa). 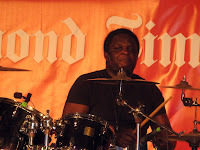 This veteran drummer lays it DOWN, keeping the beat with astonishing variety and flair. "Nabtry Dancers" Francine and Grace. While Francine's ambitions are for a singing career in another genre of music, Grace Haukwa is a talented, joyful and enthusiastic dancer. I'm willing to wager that she could perform with just about any Congolese or Kenyan band. She certainly knows the steps and the moves! 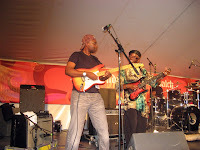 Guitarists John Bashengezi and Siama Matuzungidi. 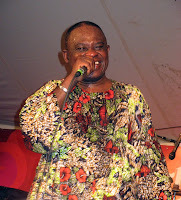 Siama (original Virunga, ex - Shama Shama and Orchestre Cavacha) tells me that he played the original Cherie Kadetti with Dona Mobeti. He's a highly skilled veteran musician. I had never heard John play before, but I guess I have missed out! that album of new material...I'd buy it in a heartbeat. I regret that I did not get a decent picture of bassist Ali Mgawe. You can ctach a glimpse of him in the group shot at the top of the page. I regret that I did not get a decent picture of Cheryl Kramer. You can catch a small glimpse of her, on keyboard, in the photo above of Samba with the Nabtry Dancers. My apologies to Ali and Cheryl!